Did you know that cotton is the most used textile in the world today? Sheets, towels, clothes... everything is made with this breathable and durable, but unassuming, fabric that we take for granted. Yet, cotton has played a very important part in the history of our world. In fact, we can say that it has really "made the modern world", as the subtitle of Giorgio Riello's new book states. In his work, Riello covers every aspect of cotton - from the raw material through to the various manufacturing processes, and its trade in the various world markets - to try and explain why cotton had such an influence in shaping our world. By the early 14th century, India was one of the biggest producers of cotton, exporting it to Europe and Africa. Cotton was a highly sought-after commodity in Medieval and modern Europe because it could easily resist washing. Enterprising merchants, realising most of the European continent wasn't suitable for growing cotton, started to develop new methods to stamp cotton cloths imported from Asia with different patterns and colours they then resold in different markets. Although several governments tried at different times to ban the trade and consumption of Indian cotton cloth to safeguard the national production of wools and linens, these backfired as they encouraged domestic production. The development of new machines for spinning and weaving, united to the political ties that united the old continent, and in particularly Britain, with the new world, whose vast territory was ideal for the establishment of cotton plantations worked by African slaves, saw Europe become the new manufacturing powerhouse, relegating Asia, which couldn't compete with the quantity and prices of their rivals' goods, in the backseat. Now, things are changing again, with low-waging Asia regaining the role it had lost. Cotton (the book, that is) is divided in three parts, each considering "the interrelationships between resources (in particular raw cotton), exchange (trade and consumption) and production (technologies, organizations, institutions and human agency)." In every chapter, Riello asks a different question and tries to answer it: why cotton and not another fabric like wool? Why Britain surpassed India and China in the production and trade of cotton? What was the role of slavery? How did the Europeans overcome the obstacles they encountered along the way? Riello examines each question in detail, objectively and without shying away from the most controversial aspects of the cotton manufacture and trade industries. I also loved that each chapter usually starts with a description of an illustration or of an anecdote relating to cotton. Books like this can be quite dry and boring, especially for those who don't usually read academic works, but these little stories hook your interest right from the beginning. Granted, this is not the type of book someone with absolutely no interest in the subject would find easy to get through. It's a scholarly work, after all. But the author, also aided by the photos, really tries, and succeeds, to make the book flow as easily as possible. Overall, I highly recommend it. It's a fascinating read that provides valuable insights on how cotton transformed the world in the past millennium. 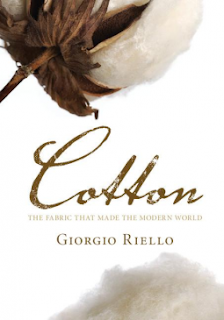 Enriched with beautiful illustrations and tables, Cotton by Giorgio Riello explains how cotton transformed the world economy over the past millennium, providing valuable insights on how Europe came to replace Asia as the new manufacturing powerhouse during the Industrial revolution. Although those who aren't into academic works may find the writing style a bit dull at times, Riello does its best to engage (and keep) the readers' attention. Overall, this is a highly informative and fascinating read.